The official Most Valuable Player of the 2015 Asian Cup didn’t fall at the last hurdle by any means. Late in the first half, he blocked a dangerous Son Heung-min’s shot rather spectacularly and then scored a fantastic opening goal at the other end soon afterwards. Overall, Massimo Luongo was once again an inspiring presence in the middle of the park for Australia, comfortably meeting his tournament standard of lunging into at least three successful tackles and pressing tirelessly. A fallen star of the 2015 Asian Cup, so to speak. Or someone who Czechs would probably call “a sad hero”. The reason behind using this expression would simply be the fact that South Korean left-back had been immense for the silver-medalists throughout the tournament (and even today, completing an incredible amount of eight tackles!) only to mess up at the very end of it. There, in the 105th minute, Kim Jin-su failed to kick the ball away under pressure and ultimately allowed Tomi Jurić to bully his way through to the penalty area. The rest of the story is, I assume, well known to you: a golden goal, in short. The official Man of the Match and unofficially also the best centre-back of this whole event. 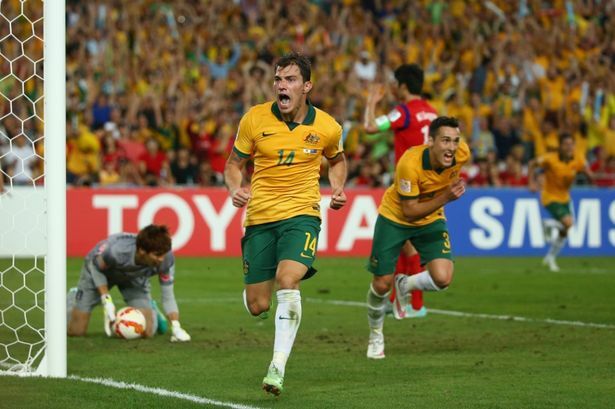 Once again, Trent Sainsbury has been absolutely stellar for Australia in every possible way: he assisted on Luongo’s opening goal with a courageous through ball, was an aerial threat in front of Kim Jin-hyeon, and in the late stages of the extra time, he went on to add a cherry on top of the cake with his fabulous block of what possibly could’ve been a goalbound shot. Terrific young lad and all round defender with a huge potential. Had South Korea claimed the trophy eventually, Ki Sung-yueng might’ve easily been declared a Most Valuable Player during the final ceremony, as four previous Asian Cup MVPs were also crowned as champions. And it would hardly be surprising, since the Swansea City mainstay didn’t disappoint in any fixture; with the final one being no exception. Ki Sung-yueng’s ball control was yet again vital to South Korea, just as was his flawless positioning and general readiness which earned him an assist for Son Heung-min’s goal. True, he probably could’ve done better to unsettle Luongo before his goal, but even there, Ki cannot be fully blamed. Oddly enough, the Australian skipper wasn’t very good here. And we could even go that far to say that the hosts clinched the triumph despite his efforts, not the other way round. Mile Jedinak seemed to be much busier with fouling, arguing and generally begging to be sent off rather than anything else, while his passing accuracy stands at an atrocious 71 %. Overall, this wasn’t as sweet a tournament as Jedinak would’ve wished for, or as one would’ve maybe expected from him. But of course, he’s just become an Asian champion regardless of all that, so who cares? It’s usually perceived to be a sign of true greatness when a key man puts in his best performance in the most important game of all, and that’s exactly what Son Heung-min did for his team here in Sydney. He’s been in the centre of action throughout the whole 1st half, constantly lurking around the right place at the right time, while he also backtracked his opponents extremely deep down the pitch offering a really useful helping hand to both fullbacks. Oh, and then there’s this one more thing: he had initially broken all Australian hearts via his equalizer late in the normal time. Did you notice Nam Tae-hee? Barely so? Yeah, well, that was mainly because of this guy. He collected an impressive number of seven tackles won and I’m pretty sure that the majority of them came at the expense of the South Korean attacking midfielder. Nam Tae-hee seemingly wasn’t able to complete a single take-on (and he attempted a few in the first half) only to be subbed off as the first player in red jersey. Hence, Mark Milligan is our unsung hero of this final, who quite possibly showed up with his best performance for the national team and basically laughed off my pre-match advice to drop him. We’ve alluded to this many times before, but it’s worth repeating. Cha Du-ri is 34 years old, he didn’t go to the World Cup only a few months ago and his international career was pretty much considered to be a closed book; yet he was simply unstoppable here in Australia. Today, he contributed significantly to the whole Leckie’s uncharacteristical inefficiency and it’s telling that no Socceroo came even close to him with his “average position”, as he’s very much unbeatable in 1-on-1 situations and loves to drive people mad with his powerful runs forward. Cha Du-ri is most certainly going to retire someday soon and that’ll be a huge shame, since he obviously, as the fittest South Korean featuring in the final, still has one more Asian Cup in him. In my preview here, I was urging Robbie Kruse to step up now, when it matters the most. And by that, I’ve probably jinxed him or something. Because not only did he not deliver and was awfully anonymous throughout the encounter, but he also received a yellow card for “feigning” an injury, which according to some reports will see him miss the next 12 months. This fellow just doesn’t have luck on his side and watching him hobbling on crutches at the awards ceremony was a terrible experience even for a neutral. I know, he’s not a player per se and therefore I shouldn’t be mentioning him here, but forgive me, I simply have to. After all, he undoubtedly played a key part in the whole final match because of his slightly ridiculous substitutions. When he used his last option in the 87th minute to replace a striker with a central defender with his team being down 0:1, it was one of those unexplainable moments. For Uli Stielike himself, it was originally a clear “either a genius, or a dumbass” situation, yet he ended up being both simultaneously. At first, this unorthodox strategy actually paid off with South Korea getting a late equalizer. But eventually, his plan to finish the game with four central defenders and two holding midfielders somewhat inevitably backfired on him. The Taeguk Warriors spent extra time on the back foot, which ultimately cost them, as they ran out of energy quickly.